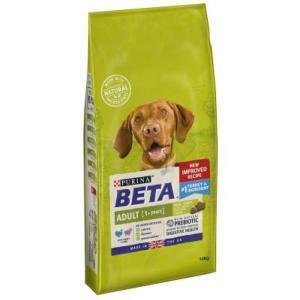 BETA 100% complete and balanced nutrition tailored for adult dogs to support continued growth and energy needs of playful young companions. At this stage in your dog’s life he is generally in good health and very active. Our adult products are specially formulated to help support the steady release of energy through B vitamins, provide essential minerals and high levels of protein to help continue to build strong muscles, and for strong teeth and bones – helping to keep your adult dog at his most adventurous.